The Crawley Irish Festival, the only Irish Summer Festival in the South East of Britain, returns on Sunday 26th August 2018 showcasing some great Irish entertainment, music, sport and dance and much more. Attracting over 6,000 people, it’s recognised as a high profile Irish Festival here in the UK. featuring a number of arts workshops, Irish Dancing Demonstrations, four music stages featuring traditional and modern Irish music, televised GAA sport, children’s entertainment, educational areas, craft stalls and shops selling traditional Irish produce and arts & crafts. 15 bands in total play traditional to contemporary to easy listing in three different areas including the world famous (in Crawley): “12 Hour Music Session”. John McNicholl over from Derry heads a list of International entertainers and top billing acts. And the event is absolutely free. Multiple bands will perform – together with acts from across the festival – each providing 15-20 minute sessions throughout the day. Running till 5.00 are well catered for in the J DEVINE CHILDREN’S ENTERTAINMENT ARENA with particular emphasis on traditions and folklore workshops, kids drama corner, magic tricks and song and storytelling. 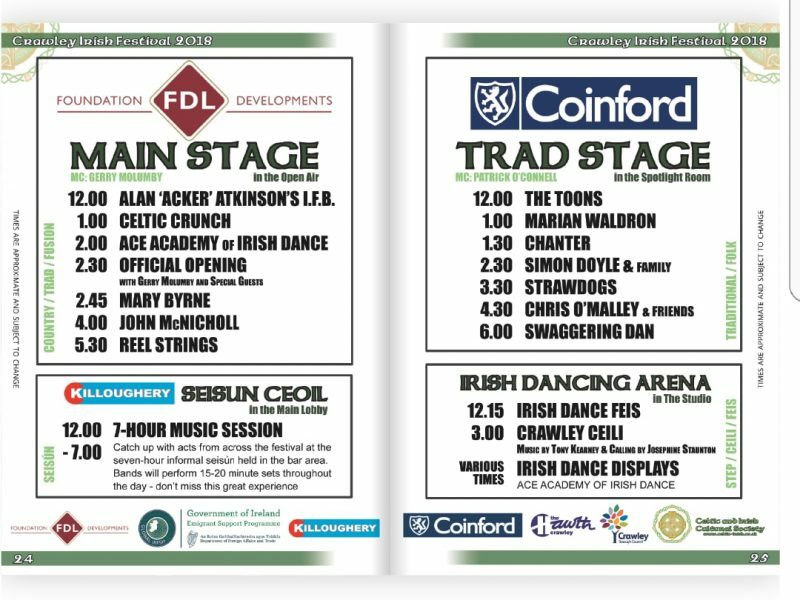 So keep Sunday 26 August free in your diary for Crawley’s biggest Irish Festival ever. Visit us from 12 noon at The Hawth Theatre Grounds, Crawley, West Sussex, just a short while from Gatwick Airport.